Japanese Episode DP 026: "Pokemon Contest! The Sono'o Convention!!" American Episode 490: "Getting The Pre-Contest Titters!" Hikari has finally arrived in Sono'o Town! As she prepares her Pachirisu for its first official Pokemon Contest, the young Coordinator is approached by her childhood friend, Kengo! Hikari tells her traveling companions that she and Kengo grew up together in Futaba Town and that he left on his journey a little bit before she did. Kengo tells our heroes that he's a Pokemon Coordinator and says that he hopes to win his first ribbon with his starter pokemon, Pottaishi. Kengo then announces that he would like to have a pokemon battle to practice for the Sono'o Convention, so he chooses Satoshi as his opponent. Hikari's traveling companion accepts, and before long a battle between Kengo's Pottaishi and Satoshi's Pikachu begins. As the two pokemon dodge each other's blows, Kojirou and Nyasu appear to kidnap Pottaishi so Musashi can use it in the Contest. The penguin pokemon is quickly put out of commission, so Hikari steps up to rescue it. During the ensuing battle, Potchama gathers up a large amount of energy and, much to everyone's surprise, unleashes a powerful Whirlpool attack. Hikari's starter pokemon makes quick work of the Rocket-Dan, saving Kengo's pokemon in the process. Now that Potchama has learned a new attack, Hikari is confident she'll take the ribbon! The day of the Sono'o Convention arrives, and Hikari's Pachirisu takes the stage for the Appeals round. Everything's going well until Pachirisu stumbles off the stage and starts to freak out. Can Hikari pull together a strategy to get her out of this predicament? To be continued! The second of Hikari's Contest rivals makes his debut in this episode. Making Kengo childhood friends with Hikari added a great aspect to a character who was, quite frankly, pretty stale. I mean, if it wasn't for this connection to Hikari's childhood, what would Kengo be? A boring character with a generic character design? Hopefully, he'll develop a personality in the future because right now, he's one of the most dull Coordinators since Mama-san. The tone of the "catching up" conversation is a bit different in the dub than it is in the Japanese version, but that's really the only thing worth mentioning in my opinion. A lot of people didn't care for Kenny's voice, but I thought he had the generic woman-trying-to-do-a-little-boy's-voice thing going for him. People have had no problem the hundreds of other times this voice has been recycled, so why are people getting upset now? Kenny: "What do ya know? Dee-Dee's got herself a Pikachu." Kenny: "Dee-Dee's all grown up!" Dawn: "Kenny, stop! And you stop calling me Dee-Dee, too! Also, this is not my Pikachu, either. Cuz it's his!" In the Japanese version, Kengo's nickname for Hikari is "Pikari." Once he sees Hikari with Pikachu, he assumes it's hers and declares the two of them to be the pika-pika combo, Pikari and Pikachu. The pun wouldn't make sense at all in the dub (since they gave Hikari a name that sounds nothing like Pikachu), so they had to pretty much gloss over it. Hikari: "You saw the Kotobuki Convention? Does that mean you're a Coordinator?" Dawn: "You were at the Jubilife Contest? Were you competing or just watching?" Kengo: "Yeah. Hikari, you mean you didn't watch my debut battle on TV?" Kenny: "Uh, excuse me. My match was on TV, so why weren't you watching?" Hikari: "Ah, I'm sorry. I didn't know..."
As you can see, Hikari didn't even know that Kengo was a Coordinator. Dawn, on the other hand, knew about it but wasn't able to watch his debut match on TV because she was busy. Later, Dawn talks about Ash and his accomplishments as a trainer. Kengo: "So, you guys started traveling together from Kotobuki City?" Kenny: "So you guys first hooked up in Jubilife, then?" Hikari: "Nope, we've been traveling from the very beginning. Satoshi is a great trainer, y'know! Before the Contest, he was really cool in a battle at the Kurogane Gym! He defeated the powerful Gym Leader, Hyouta, and even won a Gym Badge! Dawn: "Mmm-mm. Before that. We first met after I rescued Ash's Pikachu for him. And later, I watched Ash battle at the Oreburgh Gym two whole times before he finally earned his first badge in Sinnoh." Hikari talks Satoshi up a lot more than Dawn does. In fact, the way Dawn phrases everything makes it sound like she's trying to point out how great she is. 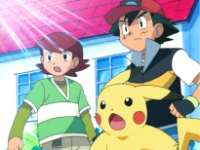 "I rescued Ash's Pikachu," "two whole times before he finally earned his first badge." The meaning's the same, of course, but the delivery is totally different. Finally, Ash has a line about how Dawn always says "no need to worry." The thing is...this isn't the case. PUSA seems to have been having trouble figuring out an equivalent to Hikari's daijoubu, so Dawn hasn't always been saying "no need to worry." However, maybe PUSA will finally pay attention to this catch phrase of hers and settle on "no need to worry" as a translation. Little things like this really help add some flavor to the script, so I hope the dub will keep it up and not abandon it the way 4Kids abandoned all the cat noises Meowth used to have peppered in his dialogue in the first season. The TO BE CONTINUED screen is three seconds longer, giving you three extra seconds to look at that picture of Pachirisu running around like a spaz.